Macri's political enemy, former Cristina Fernández de Kirchner, takes to Twitter to compare current government with last military dictatorship (1976-1983). 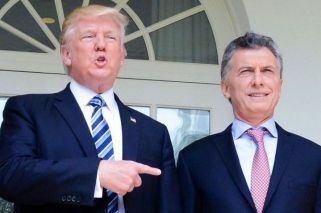 The United States will send the largest ever cache of declassified documents about Argentina's 1976-83 military dictatorship, President Mauricio Macri announced Sunday. "Three years ago, we began a request with the United States government to declassify the documents in their possession about the dictatorship. Since then, we have achieved two deliveries of material and next month there will be another important set of military documents delivered," Macri wrote in a tweet. Observers believe Macri and Barack Obama's strong relationship during the former US president's last years in office was a determining factor in securing the release of documents. And despite fears about US President Donald Trump's approach to Argentine requests of this nature, the new US administrations seems to be sticking to previously given promises. "It is the largest volume of information the United States has ever given to another country. These documents will be fundamental for the Judiciary to progress in cases that remain outstanding about one of the darkest chapters of Argentine history," Macri added. His political enemy, former president Cristina Fernández de Kirchner, also took to Twitter to reflect on the anniversary, with an aggressive criticism of the current government. "Yesterday and today: Austerity in wages and retirements, destruction of national industry, [an] increase in poverty, [the] financial bicycle, and persecution of political opponents. Same policies, same results." In a separate post, she wrote: "Memory, Truth, Justice, Democracy and Unity to stop this looting against Argentines." The former head of state reportedly watched the day's marches on TV, from her apartment in the Retiro neighbourhood of the capital.